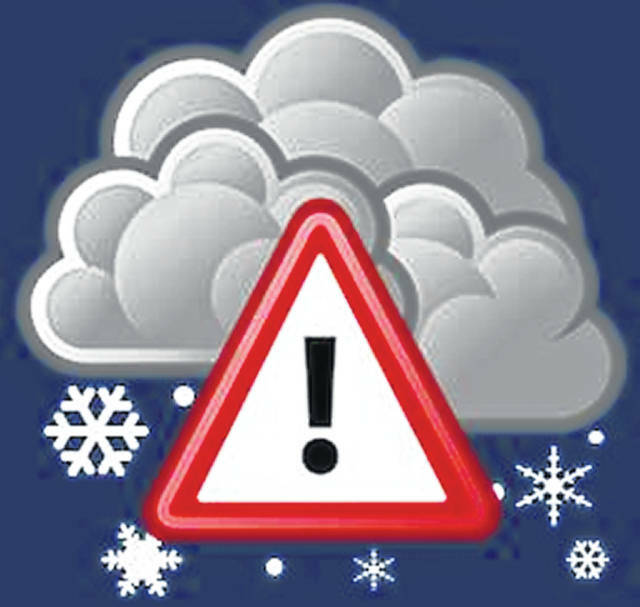 Fayette County is under a winter storm watch until 4 a.m. Sunday with the possible snow accumulation of four to eight inches. This potential impact is from Winter Storm Harper, as it moves through the midwest and the Ohio Valley. Predictions, as of Friday afternoon, indicate the county may have a significant snowfall in the north and ice accumulation in the southern portion, according to Fayette County Sheriff Vernon Stanforth. – Stay indoors and dress warmly. – Drink water, including warm broth and juices. – If going outside, wear layered clothing, mittens/gloves and a hat. – Watch for signs of hypothermia and frostbite. – Keep dry. Change wet clothing to prevent loss of body heat. – Check on your neighbors and make sure they are okay. – If you use a fireplace or kerosene heater, make sure the room is ventilated. – If you use a generator, make sure it is only operated outside. – Do not over-exert yourself. Heart attacks from shoveling snow are the leading cause of deaths during winter storms. – Keep a slow trickle of water flowing from faucets to avoid frozen waterlines. The snow and freezing rain are expected to begin Saturday before 3 p.m., then snow between 3-4 p.m., then rain after 4 p.m., according to the National Weather Service in Wilmington. The high temperature is expected to be near 33 degrees. On Sunday, it’s expected to be mostly cloudy with a high near 16 degrees. It is predicted to be blustery with a north wind at 14 to 20 miles per hour. Stay with the Record-Herald for more as winter weather hits the area.